It's an unlocked entry-- go for it! Nice find. That Swindle retired stencil is sweet. We strongly recommend that you do not complete this purchase. Purchases of items listed on eBay but then completed outside of eBay are extremely risky. They are not covered by eBay buyer protection programs and are highly susceptible to fraud." And the seller is no longer a registered user (good thing I PDF'd that auction). I know who this seller is, or at least who I sent the money to, and they are also a board member here. Very strange. I won the auction for the records that they had up. My auction is longer showing up as well. Any advice on what I should do? spagucci1 wrote: I know who this seller is, or at least who I sent the money to, and they are also a board member here. Very strange. I won the auction for the records that they had up. My auction is longer showing up as well. Any advice on what I should do? First you should out them on this thread and then let a bunch of wild accusations fly. Secondly, why would you have touched that with anything short of a ten-foot pole? Last edited by cybernigel on Tue Mar 10, 2009 2:26 pm, edited 1 time in total. cybernigel wrote: First you should out them on this thread and then let a bunch of wild accusations fly. Burn 'em at the stake! ARRGH! Kill 'em all! AHHHH! Let's get them! ROOAR! This thread will be moving to Giant vs. Giant in a moment. That sub-forum has wider access and it seems like the thread might be moving in that direction, anyway. I did not win the stencil, I won the auction for the signed records. Gotcha. Well I hope they don't do you wrong. You are a well-respected member around here. Good luck. There are easier ways to make $700...especially in Lynn, MA. admonkey wrote: This thread will be moving to Giant vs. Giant in a moment. That sub-forum has wider access and it seems like the thread might be moving in that direction, anyway. Can we merge the "who?" pictures from the thread about thetruth55 or do we actually need to repost them here? Its not thetruth55. If I don't get a response from this member within 48hrs, I will make sure that the Forum knows who this member is so nobody gets ripped off any further. Thanks, my shitlist is getting lonely. Besides, if they have nothing to say in response to an entire thread calling them out, they need to be outed. I wasn't trying to imply that it was him, but there was a funny part of that thread before he was revealed when people were clamoring for his identity. Just got a PM from the seller. Everything should be kosher, but I will keep everybody in the loop. 3) What's the provenance on the McGee piece that's also in question? Secondly, i hope you get everything sorted spagucci1. *EDIT* That sounds bad, i mean, i like the threads that reveal a d o u c h e on the board. Not people being ripped off. UPDATE- I recieved my records today. I'm glad that everything worked out. Really digging the etching. Hope to get them framed by the end of the weekend. 1) eBay user "juliz1215" puts an item up on eBay billed as an authentic, 1/1, retired stencil signed by Shepard Fairey. 2) Several potential buyers contacted the seller requesting close-up images of the signature that were never provided. 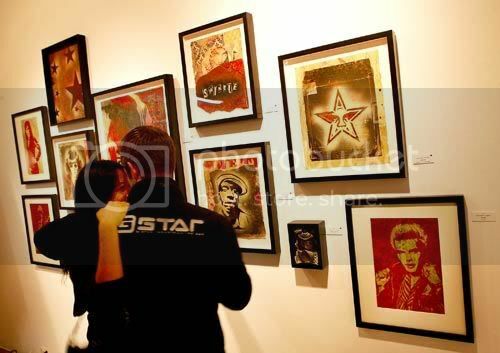 3) Obey Giant Art, Inc. was contacted directly by more than one person and asked about the legitimacy of the piece. Their response: "It's fake." 4) The eBay user "juliz1215" is contacted and notified the piece is a forgery. 5) eBay user "juliz1215" revises the auction to say she is in possession of a provenance from "the originating Gallery" that is printed on watermarked paper and that this documentation will be "revealed to the winning bidder" only after the end of the auction. 6) The auction ends, but the result is quickly cancelled and invalidated by eBay and "juliz1215"'s account is closed. 9) THEGIANT.ORG member "artasylumboston" is contacted regarding the stencil and the "Gallery provenance" is requested but is not produced after several days spent waiting, even while in full communication with the user. 10) THEGIANT.ORG member "artasylumboston"'s account is closed and banned for reasons of Community Trust. In the course of looking into the "near sale" of the stencil, the sale of other questionable pieces was brought up by people who contacted me. I am unable to verify their claims and they have no bearing on our decision to close artasylumboston's account. On a completely personal note regarding the veracity of any supposed provenance, I am left wondering if the "Gallery provenance" that was to be "revealed" to the winning bidder only at the close of the auction would have turned out to be a provenance from "Art Asylum Boston" itself. As always, caveat emptor, but particularly in this instance. Should it become important in the future (as I fully expect this piece to resurface at some point in time), I am including the images from the auction at the bottom of this post. I also have a PDF of the auction itself should it become needed. Thanks to everyone who lent a hand in turning over the stones. admonkey wrote: Thanks to everyone who lent a hand in turning over the stones. Thanks for your hard work and discovery! Nice job!! !